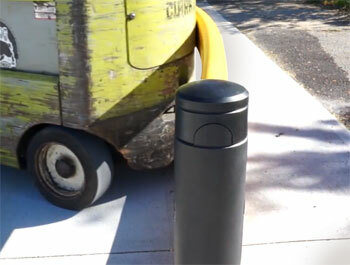 Flexible guardrail slows down forklift impacts and returns back to its original state. This not only reduces repair and maintenance cost on both the guardrail and the forklift, but also provides a less stressful collision for the driver. With a steel guardrail, all of the energy from an impact is released all at once through the forklift, the railing, and the lag bolts holding the railing in. The sudden release of energy often causes damage to your lift, your concrete floor and requires that the guardrail section be replaced. However with flexible guardrail, the impact forces are slowed down by the flex of the rail and dissipate through the internal layers of the rail's core materials. Flexible impact single rail guard rail saves significant costs from not having to replace dented guard rail and floor anchors. This guard rail absorbs forklift impact then returns to its original shape to prevent damage to rails, floors and vehicles. Double rail flexible guard rail withstands high speed forklift impact and heavy load collisions without damage, the need to repaint, replace sections or make repairs. Polymer rails absorb impact forces and return to original shape. Pedestrian guardrail withstands forklift impact to help protect people along walkways or near equipment that they may be working with. Rails flex and absorb impact forces to prevent denting, scarring or damage to rails, floors or vehicles. This multi-rail barrier combines the benefits of flexible handrail and floor-level guard rail that can absorb forklift impacts and flex back into shape. The upper rails are tall enough to contain and protect pedestrians, while the bottom rail prevents forks and loads from encroaching under the barrier.